The Pro 2000 is a unique float tube in the Caddis line up. It features a tear drop shape with low profile floats that enhances the stability of the boat and makes fly or spincasting easy. The critical seams are all double-stitched. Bighorn "Trout Unlimited" Float Tube. That's why this Big Horn Float Tube is perfect for us. It's extra large and extra buoyant. just the ticket for us big boys! Rugged nylon construction is amazingly durable. Float Tube Malabu. Condition is Used. Shipped with USPS Priority Mail. What you see is what you get. It is in excellent condidion. Never Used. FLOAT TUBE ONLY! No Pump or Fins! Two side storage pockets. U-BOAT 2000. You can bring this along with you as checked luggage anywhere in the world. This is fully warrantied for life by Dave Scadden Paddlesports. Original sales receipt will be included. Brocraft Float Tube Fly Rod Holder rod holder is designed for float tubes and pontoon boats. Brocraft Float Tube Fly Rod Holder will rotate and lock into any desired position so you can have your rod/reel combo positioned the way you like. Gently used high thrust float tube fins. These fins high some minor scuffs, but overall they are in great condition! Please email me with any questions and good luck bidding! Thanks! Condition is New. I've switched to kayak fishing so no use for it now. 50 foot anchor line included. Made in the USA. The Drift Sock features a weighted bottom and floats at top that allow sock to automatically open when thrown into the water. 20 denier rip stop nylon. Extensive Selection. HELPFUL LINKS. Cold Steel. Give your fenders and boat that added touch of class. This beautiful black fabric has the Polyform logo embroidered in gold thread for that sophisticated look. Custom fit to Polyform fenders. Elegant and durable boat fender covers. For sale is an Outcast fish cat 4 fishing float tube, and over shoe flippers plus a 12v quick air pump. Air pumps up belly boat pontoons quickly. All items are in great shape. Float tube has no leaks and all zippers work. Flippers work great and are designed to fit over shoes. Boat Specs. Valve: Tube Summit. Seam Construction: Welded. Fabric Denier x Material Weight: 420 coated nylon. Features a weighted bottom and floats at the top to help it open quickly. • Includes 1 drift sock. Extensive Selection. HELPFUL LINKS. Cold Steel. Combos (Rod Reel). Baits & Lures. Excellent Service. Warranty: 5 Year. Helpful Links. Weight: 65 lbs. More about the Vector Float Tube from the Vector Website The contents was removed for pictures and inspection. Dual Fly Patch and Versatile Front Rod Holders. I will list any flaws that I have detected. If you like the maneuverability of pontoon boats with an improved rocker and often find yourself on both rivers and reservoirs, the Fish Cat is your perfect match. A sturdy all-around boat for any size of angler, this pontoon boat features longer pontoons to accommodate more gear without sacrificing compactness and portability. Condition is Used in excellent condition. Easily secure and carry up to 4 rods on your next lake fishing trip with the Float Tube Rod Rack. Self draining basket. Holds 4 rods. Easy to secure. The Fish Cat 5 Max is designed for big and tall anglers. Warranty: 5 Year. Valve: Boston. Fabric Denier x Material Weight: 420 x 1000 pvc. Load Capacity: 300 lbs. Weight: 15.5 lbs. Model #438. ODC 420 Ultralight. A Super Compact, lightweight model, coupled with our 420 Inflatable AIR SEAT Back and Bottom. Lightweight 420 denier nylon cover. The inflatable AIR SEAT increases flotation and allows you to sit higher out of the water. This is Caddis Float Tube Fins. I might not have known enough to provide the right details. Carrying Inflatable Float-tube for Fishing. · Two drink holders; two rod holders. · Orange rear visibility panel. · Rugged PVC bottom. · Two cargo pockets with easy-open double zippers. We will be happy to assist you in any way possible. New In Box, 7 Seven Bass-One Float Tube, Float Tube-fishing Float Tube. See specifications in second photo. I accept paypal . Payment must be received within 10 days of auction close. Buyer pays ground shipping/handling. Caddis Float Tube Pro 2000 in like new condition. Only used once. The storage pockets are oversized, with a patch to hold your flies attached. The rod holder is in front for easy access and D-rings to attach accessories. Unique pontoon styling makes this tube both stable and easy to maneuver. Features convenient, maneuverable, low-profile 9' quad pntoons. AIREcell Material: Vinyl. Fabric Denier x Material Weight: 1000 pvc. Length x Width x Height: 9' x 60". Aire Chambers: 4. New Fishmaster 350 Large Float Tube Belly Boat Fishing Tube RARE!!! New Fishmaster 350 Large Float Tube Belly Boat Fishing Tube RARE!!! Fishmaster MFG Company set the standard for fishing float tubes that will last most a lifetime. Model 350 - Large. Super tough, polyester vinyl coated. Will not rot or mildew. Round float tube. Original paperwork and instructions. Straps. Comes with a brand new inner tube ($50 value) inside the float tube cover. Just needs to be aired up and hit the water. Fishmaster MFG. CO Oklahoma City, Oklahoma. Condition is New. See pics for details. What you see picture is what you will get. Shipped with USPS Parcel Select Ground. 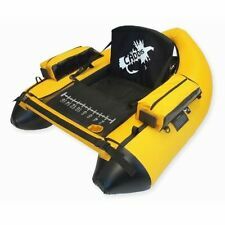 Fish where traditional boats can't with the The Bighorn Float Tube by Classic Accessories. Features high and dry seating and an open-front entry for easy boarding and landing. The open-front design makes getting on and off a breeze. Sorry, no PO Boxes. All zippers work. The drop stitch floor and drop stitch seat air pressure, max 1 bar. The tube air pressure in bar, max 0.25 bar. 0,9mm armored PVC sheet. Practical foot pump included. Heat sealed and reinforced seams. Fabric Denier x Material Weight: 1000 pvc. Warranty: 5 Years. Helpful Links. Weight: 63 lbs. 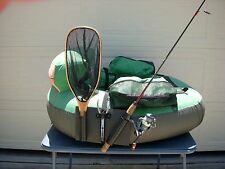 *BRAND NEW* Float tube w/ accessories! It was removed from box to inflate and inspect quality, but it has never seen water. 350lb capacity. · High back stadium seat with adjustable backrest for extra support and comfort. We will be happy to assist you in any way possible. When you're heading out onto the water to catch some trout, bass, or other freshwater fish, you want to be able to get to where the fish are biting. Going into the water in a fishing float tube can give you the power of maneuverability. A fishing float tube is portable and has a manageable weight, so it can be ideal for any angler trying to get to a perfect fishing spot. What is a fishing float tube? A float tube is a small, inflatable boat that can hold one fisherman and his or her gear. They can be quickly launched from a variety of spots. Any punctures in the tubing rafts can be patched on the spot. Shape: The tubes can be U-shaped, V-shape, or circular. Material: These inflatable float tubes are made out of a strong synthetic material like nylon, PVC, or vinyl. This waterproof material is resistant to tearing as anglers take them in and out of the water. Gear: It's always a good idea to wear a life vest when out on a boat. To keep your legs dry, you can wear chest waders. 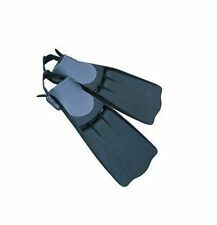 Duck fins or diving fins strapped to your feet can let you move efficiently. Some inflatable float tubes come with oars. What features do float tubes have? Fisherman usually have a lot of equipment, and float tubes are able to carry all of that gear. Fishing rod holders: These holders allow you to secure your fishing rod or rods. A float tube may come with one or two fishing rod holders. Zippered storage compartments: On most float tubes, you'll have zippered compartments on either side of the seat for fishing gear like flies, hooks, lures, and bait. The boat may have a storage space in the back for a cooler, extra fins, or any other additional gear. Aprons: So that you can have a work space with you, float tubes typically have a center apron, with or without a fish ruler. Beverage holders: Depending on the day you fish, you might want a hot or cool drink with you on your boat. Backpack or shoulder straps: This let you easily transport the float tube before and after fishing. What are some brands of fishing float tubes? Since anglers could spend hours fishing on lakes, fishing float tube seats are designed to provide lasting comfort. Some float tubes have adjustable backrests so anglers can find the right fit. Foam cushions: Some fishing tubes, like the Cumberland boat, have a padded foam seat. These can comfortably support weights of up to 400 pounds. Inflatable seats: In some basic float tubes, the seat is created by inflating a separate backrest bladder. The seat itself would be a strong piece designed to sit on the water, like nylon, PVC, or vinyl.